Cara-Lyn Morgan, Cartograph (Saskatoon: Thistledown, 2018). Paperbound, 108 pp., $17.95. A cartograph is an illustrated map, an amalgam of symbolic lines, a two-dimensional metaphor for a landscape in all its layered complexity. In this collection, Morgan performs poetic cartography, mapping places and illuminating them with the imagery of human stories lived there. Her waypoints are family, the places they inhabit, and locations that have defined her own life. Morgan herself is the confluence of two lines, tributaries from very different sources that each carry the detritus of past struggles. 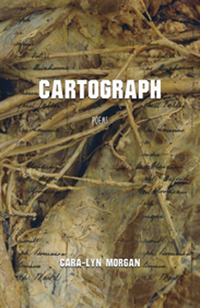 In Cartograph, she contends with this mixing of waters, examining the ways in which the past inevitably inflects on the present, even as we guide it in new directions. A short opening section entitled “kâ-itâpisinahkâtêk ôma askiy — map” introduces Morgan’s Métis heritage as it traces the vista in each of four directions around a childhood home—the old church, the lake, the sky, the shore—then, like the movement of a camera shutter, closes and opens on the title page of the following section: “how beautiful this place.” After warm descriptions of a homecoming to the prairie landscape and encounters with other places (Toronto, New York, Vancouver Island), the tenor of the work shifts in the third section, “quiet and weak and still,” in which the speaker navigates life following a car accident. In these poems, bodily injury brings Morgan into intimate contact with the medical world. As her body becomes a terrain of medical practice, the activity “uncovers // my weariest darks,” “the bad memories in the meat of the shoulders,” forcing her into a confrontation with a past locked deeply inside her. In “haunt,” a poem dedicated to her father, she relives her dread at being called into her father’s medical office with its “pictures / of inflamed and dripping / colons, slick intestines” “to sit across the interminable desk / and recall all the ways / I have failed you.” The poems that follow move through the blood and bones of kinship as both body and spirit heal from past trauma of deaths, migrations, and familial rifts. In the final section, “love, selfishly,” Morgan offers an homage to grandmothers, a niece, and parents, arriving home, at last, to the great love she has long awaited. Throughout the book, Morgan probes at the nature of ancestry and identity: who we are descended from, circumstances we marry into, who we become over the course of our lives, and who we remain. In her maternal grandmother’s voice she writes, “Shook off my Irish name / and remembered the name / of my bones.” In a series of poems set in Trinidad, Morgan recounts her father’s exceptional story: one of eight children raised by a poor, black, single mother, he found the means to educate himself and travel to Canada where he worked on the prairies as a doctor. Her effort to understand his character and its lasting effects on her own life shines through in an imagined conversation with her Trinidadian grandmother (“Little grandchile gull, why yuh judge me so?”). The poem, written in her grandmother’s voice, contends with cultural difference and the multigenerational effects of poverty. The voice of the poem conveys the differences between grandmother and grandchild (“Yuh never had babies coming one / and den nex / and den nex”) with great empathy, yet I found the transliterated patois difficult to read. The poem raises the question of how best to invoke an accent integral to both place and life history; I wondered if a subtler handling (cf. Dionne Brand, Land to Light On: “I lift my head in the cold and I get confuse.”) might capture the spirit of the grandmother’s voice without losing its flow. “Little grandchile” is just one of several poems written in the voices of Morgan’s ancestors. The shifting point of view pivots on an unseen axis, then pivots again, forcing us, like Morgan, to question our orientation, our judgements, to take nothing for granted. Like a small prairie town, a family is a collection of people brought together by the happenstance of birth, marriage, or immigration, a small collection of humanity that shares a certain proximity—though in the case of family, the kinship is bodily rather than geographical. Despite their shared genetics, this family, like others, is shadowed by insufficient love (or perhaps more accurately, by love’s thwarted expression) and by larger questions of belonging and identity. If Morgan is Métis, with an ancestral connection to the Saskatchewan landscape, she is equally Trinidadian and grapples with an arsenal of chemical hair relaxers and hot combs to fit the cruel beauty standards of an unimaginative society. The jewel of the collection is “the returning-to place.” In this moving poem addressed to her grandfather, Morgan writes “The path you are walking / is ending, and you / have walked it / so well. This is the farthest // you will carry us.” She mentions the burdens and inconveniences of old age—dentures, a speaker in a silent ear—then bids farewell: “Go now / Grandpa, to the returning-to / place.” The poem, like the others in the book, is rich with reverence for life, for each scarred and imperfect being and its lifetime of offerings. In this poem, as in the book as a whole, Morgan grounds herself within territories geographical and familial, sketching her own place on the map of all her relations.